Don't you hate it when you get to a class and realize that you don't have enough stuff to choose from or what you brought is not what you really want to do? 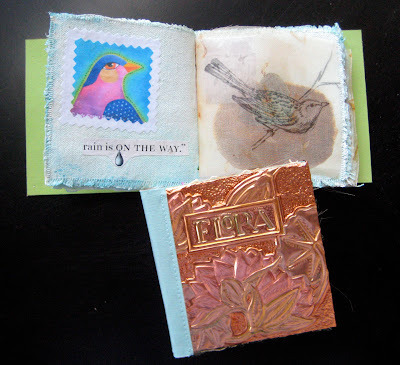 Well, I am happy to provide an option for people to supplement their stash, I have made these fun kits for my Mixed Media Copper Book retreat in August. 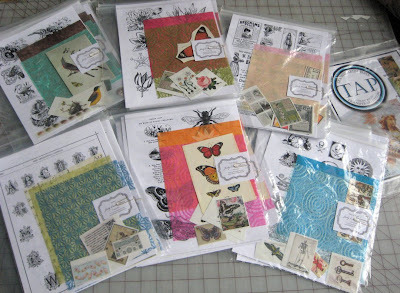 I have made six different theme packs containing 3 pages of vintage black and white images, two sheets of tissue weight art paper, a printed color paper image and several color image transfers printed on Lesley Rileys's TAP transfer artist paper. just cyberspace and I am happy to say my laptop is finally fixed, yay! I kept thinking the problem was resolved, then a day later my computer would run really slow and then freeze up after going to sleep. When I would start it up again I would get a flashing folder with a question mark on it and I would have to return to the Apple store. I went back 5 times over three weeks, thank goodness for Apple care because it never cost me a penny. They replaced the logic board, the operating system software, the hard drive, a cable connecting the hard drive to the ram and it still had problems. Then they replaced the new logic board with another one and the problem was finally solved. It seems the second logic board had a faulty port, so all the other stuff was replaced for nothing. It was a pretty unusual problem and not easily figured out. The tech help I got over the phone and at the Genius bar was always prompt and courteous, excellent service even though it was terribly frustrating. 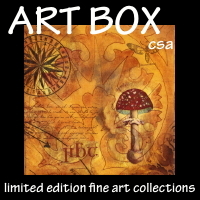 Now I am reinstalling software and files and trying to catch up with soooo much. 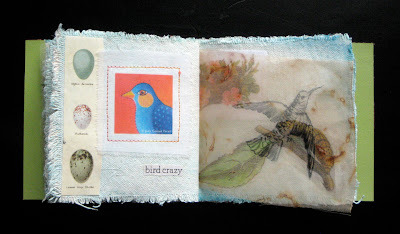 and spend a summer weekend in the woodlands of Wisconsin making copper and canvas mixed media books with me? 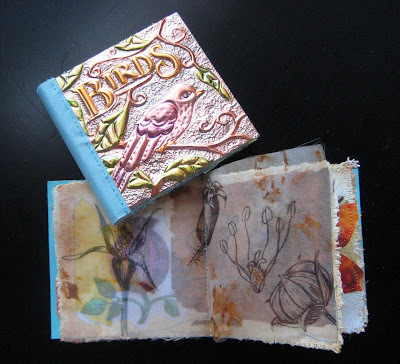 I have been invited to share my process for making these books at Whispering Woodlands in Verona, WI August 8-9, just outside of Madison. 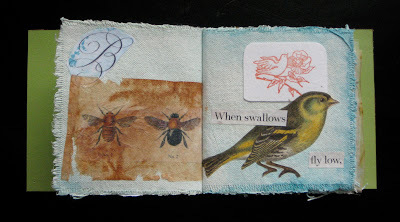 Besides having a fun, relaxing weekend doing collage, painting, working with fabric transfers and learning to emboss and color metal, you will also get a Creative Metal Tool kit courtesy of Walnut Hollow. 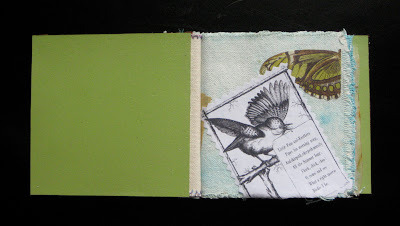 Did you know the color choices you make can transform an average piece of artwork into something spectacular? Be surprised and delighted by the effects and illusions you can create by understanding the mysteries of color. In this hands-on experiential class you'll learn key color concepts with visual examples, mix new paint colors, and create helpful charts, all providing you with the tools you’ll need to see color in a whole new light. 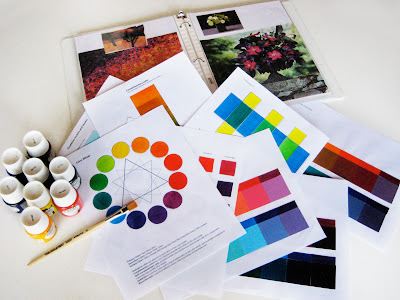 The next online Color Theory Class starts June 1. If you would like to join the class send me an email following the link on the class description page. 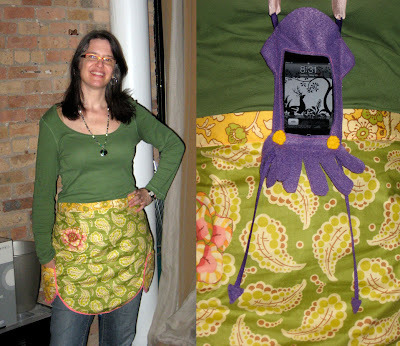 I had a lovely Mother's Day with my kids; Nina made me this awesome apron and this adorable squid ipod holder both of her own design. 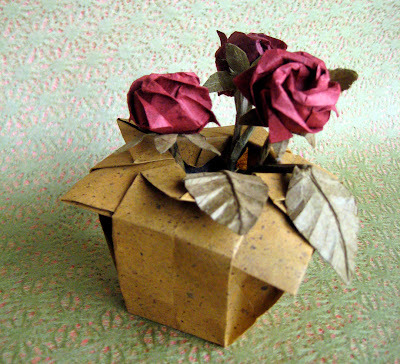 Ty made me this beautiful vase of origami roses with a promise to clean his room, truly a valuable gift, lol. In the mean time I have had a series of problems with my laptop culminating in getting my hard drive replaced today. I thought I had backed up everything I could, but after the fact, realized I had not backed up itunes, iphoto or found a way to back up my email. Thank goodness I have my blog since I have a lot of my photos there. 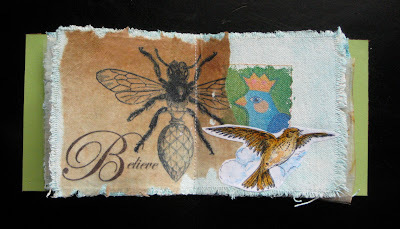 But I did loose a potential lengthy blog post tutorial I had been planning. I lost many important emails that I had saved about class bookings etc. Luckily I do have information else where but I like to document things I've discussed. I switched over to using the mail app on my computer instead of entourage over the weekend and am trying out MobileMe as away to back up email, calendar and important files online. I have been reinstalling software and setting up email accounts all day and mourning all my lost bookmarks on my browser. Daisy May's BBQ, put a lot of meat in to smoke last night. I chatted with these guys at 9 pm when I returned from picking up my laptop from Apple, it needed its graphic card replaced. They opened the doors to the smoker and showed me rack after rack of ribs, shoulders and even jerky, boy it looked and smelled like heaven. The picnic tables were filled with many people from my building, who were there to share their BBQ horror stories. 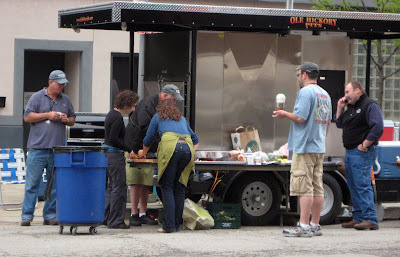 I managed to get a taste of the BBQ from the BBQ guys, it was melt in your mouth delicious! 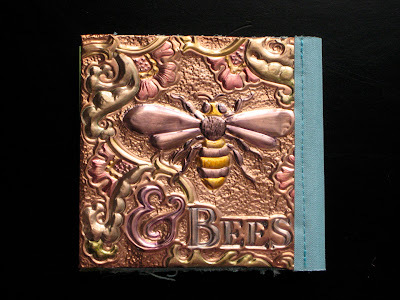 This is the finished copper book that I worked on embossing during Open Studios. 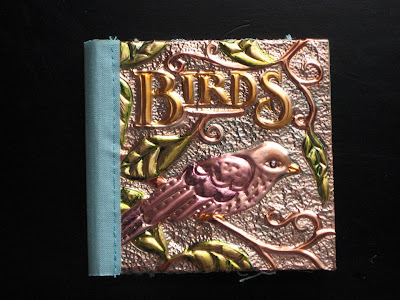 I decided to make a change to the books by backing the copper covers with painted grungeboard for extra stability. I really like the addition, giving the books a sturdy and clean finish. 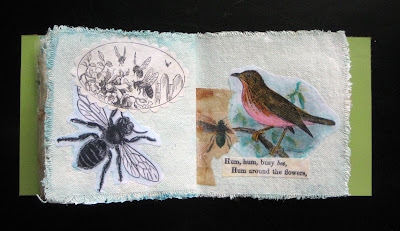 Many of the members of the Chicago School of Fusing have birthdays in May; Laura Wasilowski, Frieda Anderson, Emily Parson and Anne Lullie. Life's busy schedules prevented Emily and Anne from making it this year and unfortunately Melody is now too far away to come for lunch. 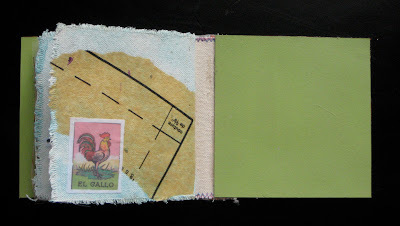 On Saturday Frieda and Laura picked up Nina and I and we drove to Quiltology, then the lovely yarn shop Nina. 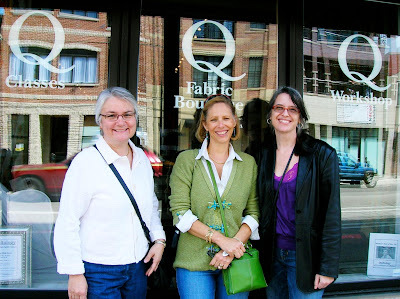 Quiltology is a small and aesthetically beautiful store, that carries a limited selection of fabrics focusing on fabric lines by Amy Butler, Heather Bailey, Anna Maria Horner and a few others. 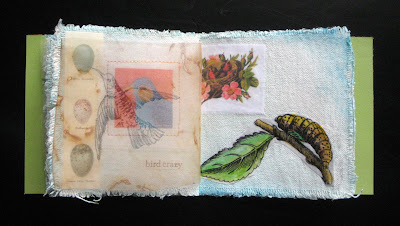 Quiltology also offers classes making simple patch work quilts using fabrics from these designers lines. This store does not cater to the serious quilter but the hobbiest who wants to accessorize their home with beautiful home sewn projects. 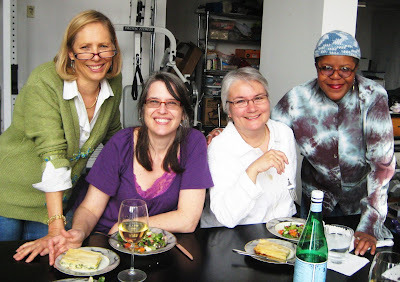 After our field trip, Trish Williams came over and joined us for lunch. 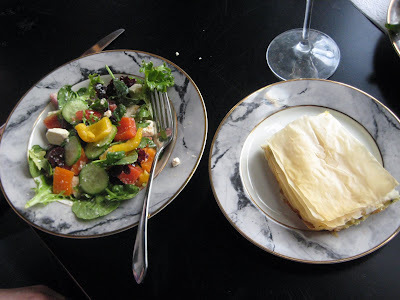 We had greek salad and spanokopita, followed by pound cake, strawberries and whip cream, yum. Less than two hours after the events at Harpo studios on Friday I heard helicopters buzzing around and looked out the window and saw the street was blocked off to cross traffic as far as I could see east and west. 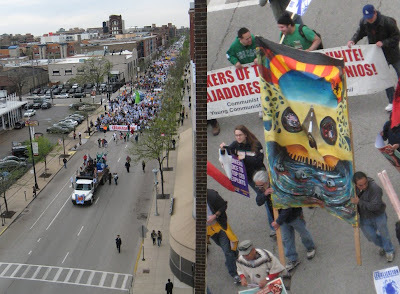 I forgot that it was the time of the year for the Immigration march. 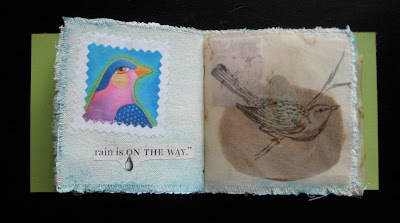 The last few years it has happened on warm sunny days, so I was thrown off by our cold overcast weather and had not expected it. 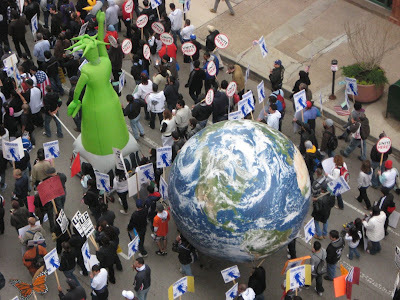 Many people seem to think that immigration is purely a Latin American issue, when viewing the march, it is clear that it effects many nationalities. I woke up to a peaceful gathering of Invisiblechildren.com around Harpo studios at 5:30 this morning. 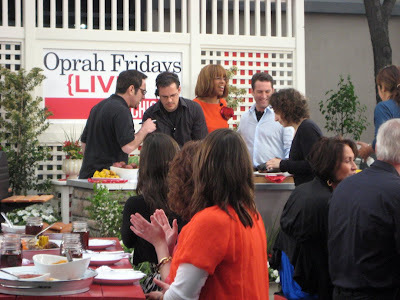 They were here yesterday afternoon singing trying to get Oprah's attention. Their cause is to stop the war in Uganda and rescue the child soldiers and get the government to write policy to end the war. You can follow this organization on twitter "#therescue". You can see their live feed right now here. So today's Oprah show is live with Ellen Degeneris and Hugh Jackman and they both know about this organization and the event, the show is live in Chicago at 9 am and 4pm everywhere else. Oprah just came out and talked to them and brought Jason inside, and he's going to be on the show. So they had success! 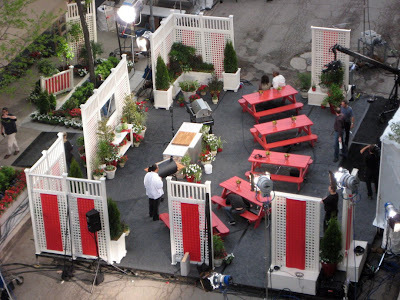 Oprah is going to come outside and tape them for the first segment of the show. I'll see if I can get some video from our driveway which will be behind them. 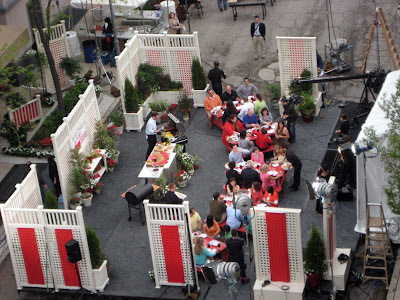 Oprah did not come outside but spoke from inside the studio on a monitor that could be seen just below the camera in front of the studio doors. The organizers were thrilled with the amount of time Oprah spent talking with them and hearing their story. They were an extremely well mannered, organized and respectful crowd, I think it really helped them get what they wanted. Job well done people! This is a clip of the group practicing to sing in front of our building yesterday afternoon. We heard them singing in our loft on the 5th floor, but by the time we got down there they had finished. Beautiful, huh? Blogger Butterfly kisses wrote a great post about her experience participating in a rescue in Denver, please go see what she has to say about it. I think we should have some cake to celebrate. 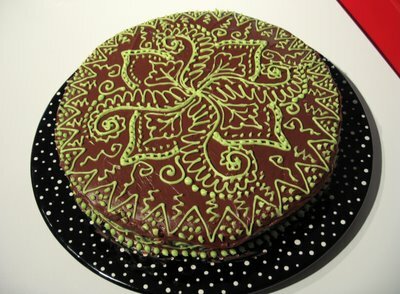 Spread batter in two oiled cake pans or one large 9 x 13 cake pan. Bake in a 325° oven until a toothpick inserted in center comes out clean, 50 to 55 minutes and 25 minutes for cupcakes. Frost with your favorite frosting. 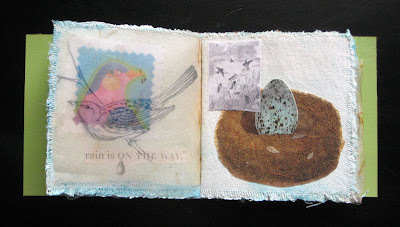 The all new Quilting Arts website has gone live, have you been yet? 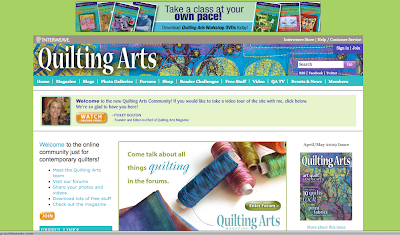 It's a whole new networking community for contemporary quilters; with forums, member pages, editor blogs, a place to share your artwork and lots more! Go check it out and join (its free).